Fruit Trees Alive!® is specially formulated to meet the growth demands of apples, peaches and most other fruit trees. 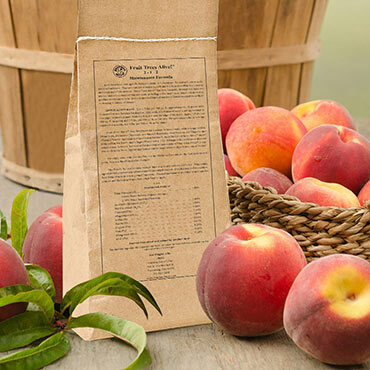 Eleven macro- and micronutrients, including copper and sulfur, produce the delicious sweetness so characteristic of well-grown, tree-ripened fruits. Fruit Trees Alive! was designed for medium to heavy soils with average fertility. On sandy soils, or for the first year of growth, use our Build- Up Formula, which contains extra micronutrients. Follow up annually with Maintenance Formula to replace nutrients used for growth and production. After using our Build-Up Formula for one year, switch to this Maintenance Formula as long as soil is not severely depleted. For best results, apply at the rate of 5 lbs. per 1,000 sq. ft. in spring, then reapply in midsummer. Fruit Trees Alive! Fertilizer Spikes gives plants the nutrients they need for healthy growth in an easy-to-use, stake form. Simply drive the stakes into moist soil (water before placing spikes if soil is dry), ensuring they are equally spaced at least 3 feet apart around the dripline. Never place the spikes closer than 2 feet from tree trunks. Hammer the spikes to ground level using the plastic pounding caps provided. The spikes are formulated using the Fruit Trees Alive! formula.